I didn’t like to admit it to any of the handball players but most of my knowledge of the game has been gleaned from watching The Legacy, a Danish TV series. 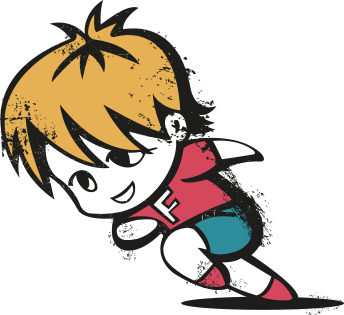 One of the characters, Andreas, is the star of the town’s handball team and more than one game has featured in the series. But it seems I’m the odd one out because London has 13 clubs, offering training sessions for juniors and adults, and interest in handball is growing. Handball’s a fast game, played between two teams of seven players. It’s a bit like playing football with your hands. The ball is softer and smaller than a football or netball and you score by throwing the ball into a goal, which is a bit like a five-a-side net. Players can move with the ball but can only take three steps before they have to pass the ball. The nearest handball club I could find to SE London (and simplest to travel to from where I live) was London GD Handball Club. The club is based at the Copper Box Arena in Queen Elizabeth Olympic Park, so I arranged to join a training session there. 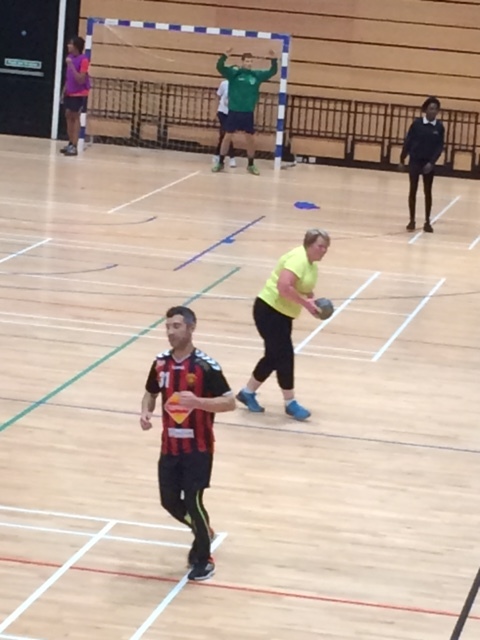 The Copper Box was busy with plenty of fitness classes and people playing basketball and badminton, so I may be visiting again! I stood and watched the two junior teams practicing before the adult beginners session. I was impressed with the speed and height the players reached as they moved up and down the court smashed the ball into the goal. I started to remember how rubbish I’d been playing netball at school. I was always last, or next to last, to be picked. I chatted to a man in an Australian rugby league shirt who was also waiting to play. I asked how long he’d been playing for. He told me he’d got interested in handball after London2012: ‘But then I took a break so I’ve only really been playing for about 18 months.’ I told him he sounded like an expert and asked him for any tips. ‘Only take three steps with the ball. Twist your body with the ball when you pass it. Warm up your hands and wrists.’ He pointed out the technique of a couple of good players and we discussed whether my experience of dragon boat paddling (with its twisting motion) could help me. I decided very little would help me. After a warm-up of more than one sprint, Tomas took those of us who were new or newish to the game for a back-to-basics session. We stood in two columns and practiced passing the ball between us, then we practiced stepping back and passing, each time with defenders trying to block our attempts to pass the ball. And to make sure we learned attack and defence, we took it in turns to be defenders. 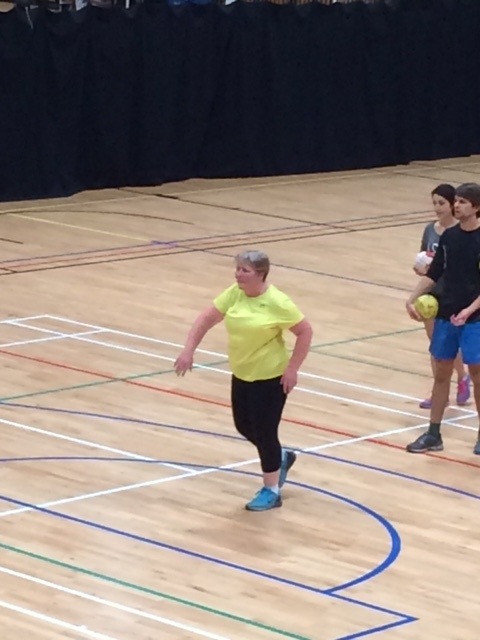 Some of our group were experienced handball players and I watched them carefully to glean any tips. 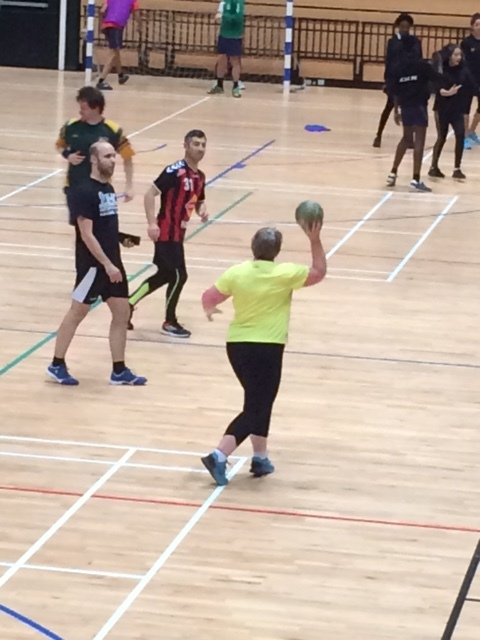 One of the group took pity on me and suggested I could use a different-sized ball (apparently the women’s and men’s game use different-sized balls) but it seemed to have little effect on my sad attempts to pass or score. We moved to the goal area and Tomas explained how to shoot when faced with one defender. Some of us knew exactly what to do, some of us struggled to aim the ball. Then we practiced the three-step rule: we jumped forward with both feet together then leapt to the right, landing on the right foot, and finally leapt onto the left foot before aiming the ball at the goal. Some of us got confused between our left and right feet, some of us took too many steps, some of us leapt effortlessly into the air and slammed the ball into the net. You might be able to guess which group I fell into. One of the group asked whether we could bounce the ball and move with it. Tomas replied that we’d leave that for a future session. I breathed a sigh of relief. Instead we practiced a set move, passing the ball between two players then moving to one side of the goal area before passing the ball to a teammate behind so they could score from the opposite side while the defenders were distracted. The only distraction I managed was to fall over. For the final part of the session, we divided into two teams (defenders and attackers) and practiced passing between our teams around the goal area and shooting goals. I did not shoot a goal. But the teams were impressive: leaping, turning, twisting. I realised handball is a great sport for someone agile, nimble, fleet. Someone able to turn, spin, and pivot. I am not that someone. If you play or played netball or basketball, I’d imagine it would be quite easy to transition into handball. I’ll stick to watching handball matches – on The Legacy or in real life.